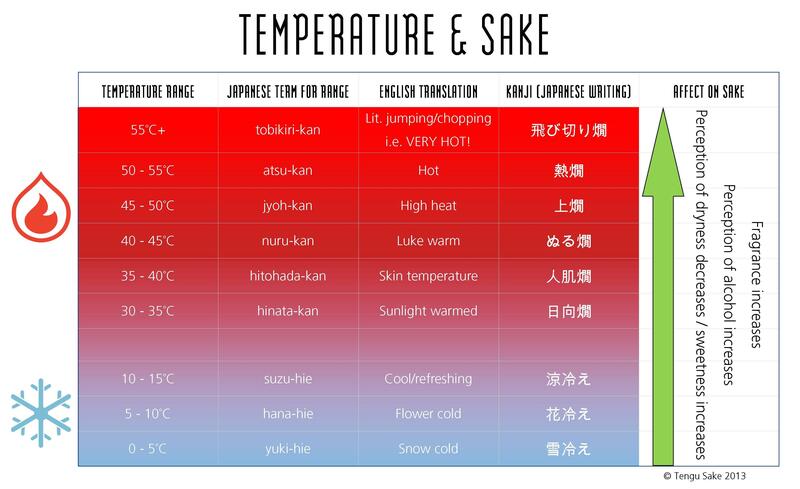 One of the most beguiling and engaging aspects of sake is its ability to be enjoyed over such a range of temperatures. Different temperatures suit different sakes and one of our favourite things is to sit down with a bottle and try it at its recommended ‘sweat spot’ temperature ranges. Every sake has one but if you haven’t been lucky enough to have been told what it is (no English label, for example) an equally rewarding task is to try and find them yourself! Quite often a sake might even have two or three ‘sweet spots’: one cold, one warm and one even warmer. We encourage you to experiment! Changing the temperature will affect the balance of flavours. Generally, cold temperatures favour fruity & light flavours whereas warm will bring the rice, mushroom and koji notes to the fore. If you’re not sure the kind of flavours you might encounter with sake, have a look at our flavours of sake page. With these few, basic principles we can begin to see why some sake generally suit being served cool, and some warm. Daiginjo and gingo generally are better suited at colder temperatures. They tend to have very delicate fragrances and flavours that will become overwhelming and/or distorted when heated; however, conversely, over-chilling might mute the nose to the level of imperceptibility! Junmai, honjozo & futsushu generally tolerate being heated. That’s not to say that they are better heated just that, because of their typical flavour profiles, heating them might bring out their wonderful rice, mushroom, cereal, honey notes (amongst others). But heating too much might give you a big whack of alcohol and acidity! Temperature also has an affect on which foods a sake is suited to and that concept is introduced on our food pairing page. The best way to warm your sake is in a water bath, basically a saucepan of hot water with your carafe or bottle of sake sitting inside. Best not to sit it in boiling water and best to have turned the flame off before you submerge the bottle. Microwaving is not criminal but our Director, Oliver, got frowned at quite hard by the brewers when he suggested this when visiting Japan!